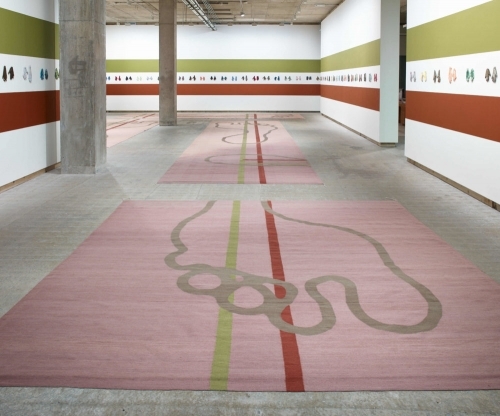 Colour is the key element in Polly Apfelbaum’s work, both visually and structurally. Earlier floor-bound installations incorporated hundreds of pieces of velvet, hand-dyed in bold hues and often arranged in sprawling configurations that appeared to be organically inspired or like abstract paintings that melted off the wall and formed vibrant puddles. More recent pieces have included an ongoing series of highly coloured and tactile ceramics, elegantly draped pieces of synthetic fabric inspired by Baroque paintings, ephemeral arrangements of glitter and vibrant hand woven carpets.